With our busy lifestyles these days, it is often difficult if not seemingly impossible to eat like we know we should. But since knowing what to eat and what to avoid is half the battle, we can at least have some control over our diet. And that diet has a huge impact on our oral health. Not only is this a low-calorie snack, but the stalk actually helps “brush” away food particles and bacteria from your teeth and gums. We are “nuts” about nuts. 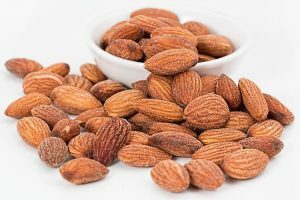 In fact, many nuts are loaded with calcium and protein that are essential for healthy teeth, plus they also provide a “celery effect”; almonds, macadamias, walnuts and other nuts can act as a mini-toothbrush by absorbing and removing cavity-causing compounds from your teeth. The beneficial bacteria in yogurt helps eliminate the harmful bacteria that can cause cavities and gingivitis. Just watch out for those yogurts loaded with sugar, though. Instead, choose Greek yogurt or plain yogurt (flavored with your favorite fresh berries). Just like your mom always said, it turns out that leafy greens and veggies really are healthy, especially for your teeth and gums. Packed with nutrients and antioxidants, a typical salad is good for teeth because of its ingredients, and also what it lacks: excess sugar, white flour and other “not so good” ingredients. Many types of alcoholic beverages have high sugar content. And if that’s not bad enough, alcohol also tends to dry the mouth out by depleting saliva stores. A dry mouth is more susceptible to cavities, gingivitis and other serious oral health hazards, not to mention bad breath. Soda not only fuels acid production in the mouth, which speeds plaque and cavity formation, but it is also packed with sugar, including high fructose corn syrup. Sour candy works quickly to create plaque buildup and create cavities due to its high acidic value. And because of its sticky qualities, it tends to linger longer than other candy. If you do enjoy it occasionally, we recommend you brush or rinse right away afterward. The trouble with taters is not the potatoes themselves, but once they’ve been fried and seasoned, that’s when they turn against you. Starches, like those found in chips, become sugars eventually, which then become harmful to your teeth. Of course, diet is never enough alone. You should always maintain your regular dental appointments to ensure that your teeth and mouth are as healthy as they can be. A surgical procedure to create an opening in the trachea (windpipe) to aid in breathing.